I love nail polish. Particularly, I love creme nail polishes. Perhaps it's because they are the best base colors for nail art, which I love to do compared to all I said I love. But contrary to what a lot of you may think, I do wear polishes as is without art ... sometimes. And I'm quite sure that you'll agree with me that plain polishes can appear boring at times and we are looking for alternatives on how to wear them differently. Polish brands have been coming up with products on how to easily add spice to a regular nail lacquer. Adding glitters is probably the easiest way and I'm glad that more and more variations of glitter polishes are coming out. 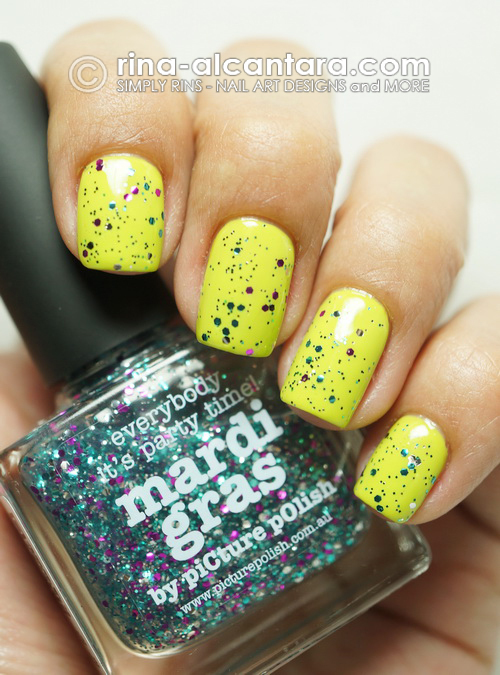 Picture Polish Mardi Gras is a glitter polish that's meant to make a regular one look more interesting and stylish. 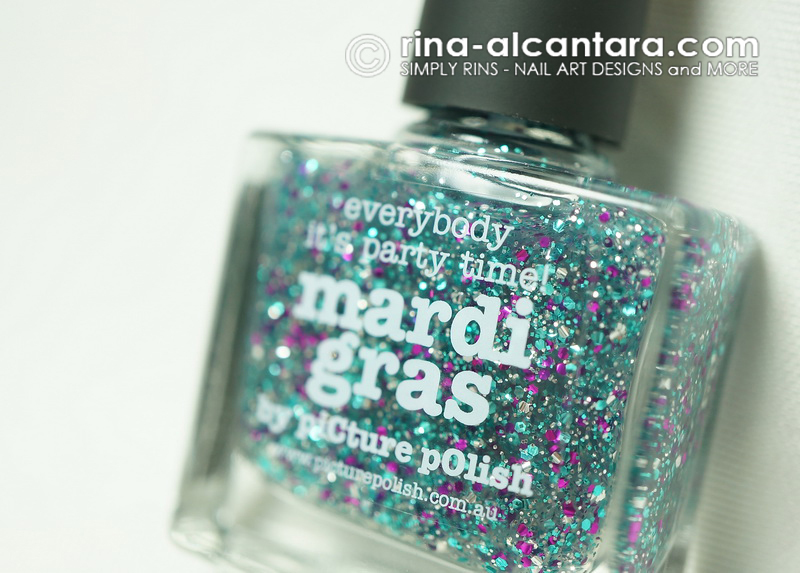 Mardi Gras is a combination of small silver and chunky turquoise and dark pink glitters with a clear base. I had no problems with the application. In all the succeeding swatches, I used 2-3 coats of Mardi Gras. This would depend on how much sparkle you'd like to wear. Picture Polish Mardi Gras over white polish. 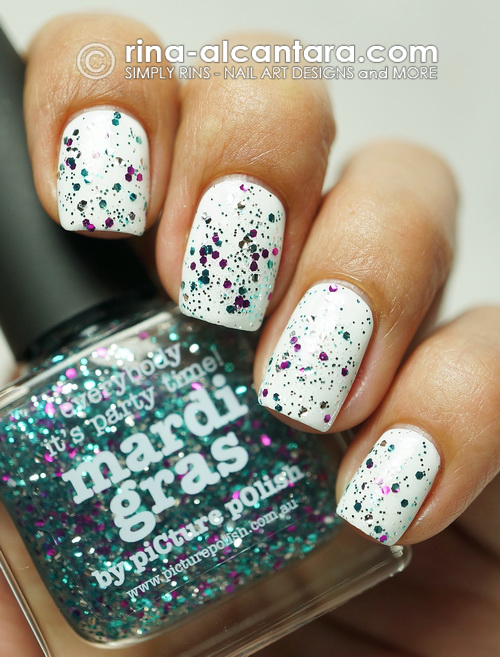 I first tried Mardi Gras over a white polish. It looked gorgeous. Well, white has always been a good base to show off colors. I applied 2 generous coats of Mardi Gras and a layer of top coat. Picture Polish Mardi Gras over light blue nail polish. 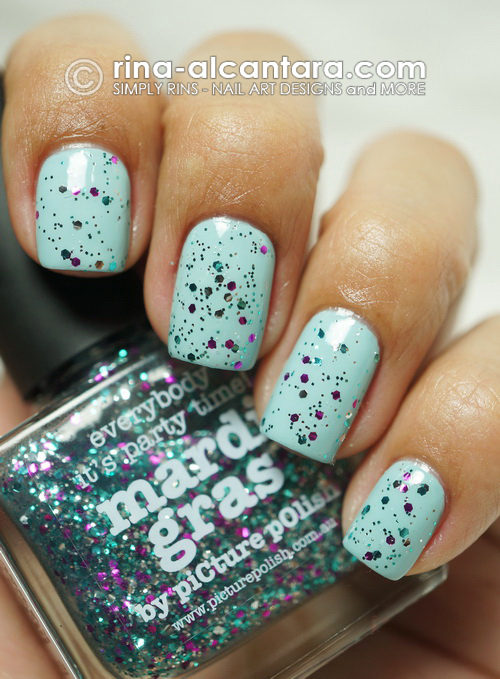 This is Mardi Gras over a light blue nail polish. I wanted to see how it would look on pastel colors. It looks lovely as well. Again, I used 2 coats of the glitter polish and sealed it with a top coat. I figured this would look great on very light or very dark colors for the glitters to really stand out. Picture Polish Mardi Gras over apple green nail polish. Another pastel I tried is apple green in color. I applied 2 coats of Mardi Gras and I instantly liked it as well. I think the background shade was a good complement for Mardi Gras. On top of my mind, I think yellow would be a fantastic base color too for this glitter polish. Picture Polish Mardi Gras over black polish. 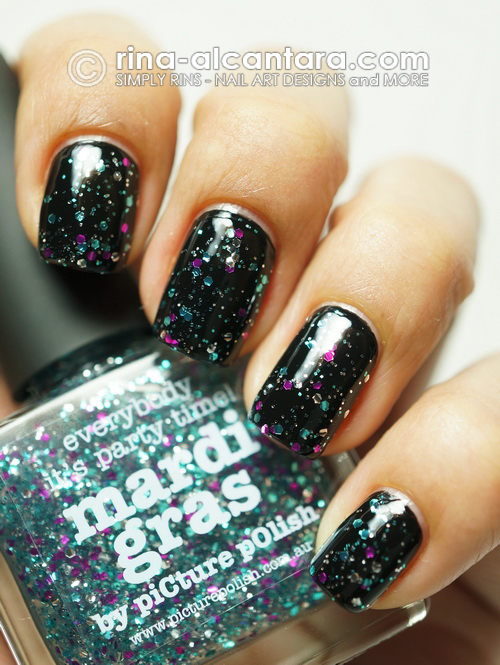 Picture Polish Mardi Gras looks absolutely beautiful over black nail polish. It added depth and the colors really shone! For me, it the combination looked really classy and sophisticated. This would look amazing for evening events. I wonder how Mardi Gras would look on dark blue? Disclosure: Item was sent to me for consideration. In no way did it affect this personal and impartial review. It's a subtle, but pretty glitter!